Blackpool has long been the entertainment capital of the north, with summer shows and top name cabaret. In the autumn the town stages the country's premier electrical extravaganza - the fabulous Illuminations. Blackpool is one of England's most popular holiday resorts with the famous 'Golden Mile' and iconic Tower. Blackpool has long been the entertainment capital of the north, with summer shows and top name cabaret. In the autumn the town stages the countrys premier electrical extravaganza  the fabulous Illuminations. Blackpool is one of Englands most popular holiday resorts with the famous Golden Mile and iconic Tower. We depart from your home pick-up and travel to Barton Grange for lunch then continue through the outstanding natural beauty of the Ribble Valley and our hotel in Blackpool, time to relax before dinner. 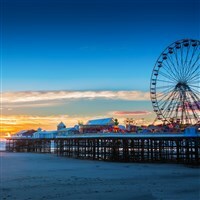 After a leisurely breakfast, the day is yours to enjoy this vibrant resort, stroll along the promenade or perhaps visit the world-famous Blackpool Tower. Today we visit the Lake District, time to explore Bowness, maybe enjoy a stroll by the lake and obtain lunch before we follow the shore road along Lake Windermere as we return to Blackpool, driving through the famous Blackpool Illuminations. Before saying farewell enjoy a full breakfast to prepare for the journey home with comfort stop enroute. Situated on Blackpools pleasant New South Promenade, the Carousel has a direct tram link into the heart of Blackpool and seafront attractions giving you the best of both worlds. Bedrooms are tastefully decorated and have TV, telephone, hairdryer, tea/coffee making facilities; the hotel also has a lift. Beginning with your home pick-up we travel to Barton Grange for lunch then continue through the outstanding natural beauty of the Ribble Valley and our hotel in Blackpool, time to relax before dinner. Situated on Blackpools pleasant New South Promenade, the Carousel has a direct tram link into the heart of Blackpool and seafront attractions giving you the best of both worlds. Bedrooms are tastefully decorated and have TV, telephone, hairdryer, tea/coffee making facilities, the hotel also has a lift.